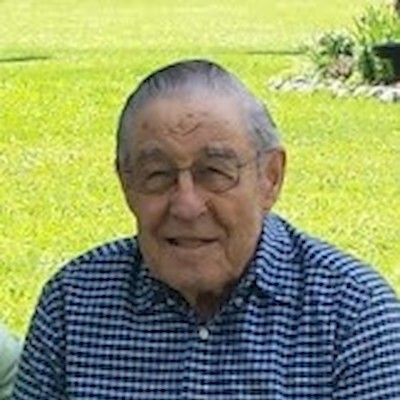 Wilfred “Fred” Francis Derousseau, 92, of Rice Lake, WI, passed away on Wednesday, March 13, 2019 with his family at his side. He was born on October 16, 1926 in Rice Lake, WI to Medrick and Cordelia (Morneau) Derousseau. Fred attended Rice Lake Schools until his sophomore year when he was needed on the family farm. In hopes of serving in “Operation Europe” in 1946, he enlisted in the army at nineteen. While stationed at Fort Lawton in Seattle, Fred proudly served on the Honor Guard. He worked for a brief time at a Milwaukee paint shop before going into partnership with his brother, Marvin Derousseau, on the farm. He was a Loyal Order of Moose member since 1972 and a lifetime member of St. Joseph’s Catholic Church. He married Lucille Grensing on April 18, 1953 in Rice Lake and they had five children. Their favorite times together were dancing, traveling and watching the Brewers. Fred loved spending time with his children and grandchildren, playing cards and entertaining them with his jokes. Fred’s passion was carpentry work, making cabinets, decks, playhouses, and wishing wells for the family. He was known as “Fix it Fred”. Farming was his life, proud to be driving tractor until his 90th birthday. He always had an eye on the crops and the weather! He was an avid Packers fan. In his earlier years, he enjoyed making maple syrup, deer hunting, snowmobiling, ice-fishing, gardening, golfing, whistling, singing and playing dart ball on both church and tavern leagues. A Mass of Christian Burial will be held at 11AM Monday, March 18, 2019 at St. Joseph’s Catholic Church in Rice Lake, WI, Father Ed Anderson officiating, with interment in St. Joseph Cemetery in Rice Lake. Visitation will be held from 9-11AM Monday at the Church. Appleyard’s Home for Funerals in Rice Lake is in charge of the arrangements. Pallbearers: Ryan Pederstuen, Jon Bednar, Ben Derousseau, Derek Tomesh, Craig Derousseau and Carson Derousseau.